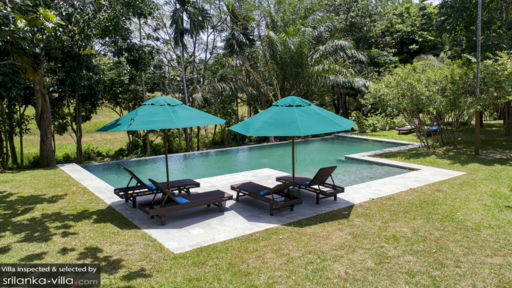 Boundary House in Sri Lanka is a surreal holiday home with sweeping views across paddy fields and expansive gardens visible from the villa swimming pool. 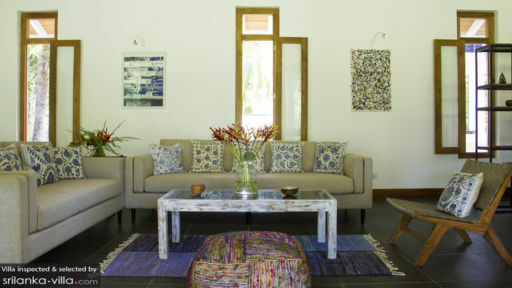 The four-bedroom villa is ideal for groups of friends, families, and colleagues on a retreat to this coastal paradise. Indulge in heavenly Sri Lankan cuisine, hit the surf breaks, and visit historical cities to soak in the colonial architecture, rich culture, and heritage of the island. The villa itself has been constructed with a similar Dutch-era architecture with a terrace, shingled roof, and whitewashed walls. With open-plan living and sitting areas, you can enjoy luscious views of the garden while sipping on some hot tea. There are four, well-furnished, and air-conditioned bedrooms at Boundary House; one of which is a master bedroom with a king-sized, four-poster bed. These beautiful spaces feature intricate and vibrant textiles and weaves that drape the bed, wooden interiors, and windows that allow in fresh air and sunlight. A second bedroom is connected to the master room to make a family suite ideal for couples travelling with children. Each bedroom has its own en-suite bathroom. The remaining two bedrooms feature a king-sized bed and twin beds also equipped with other modern amenities for the ease of guests. Both bedrooms have individual en-suite bathrooms. 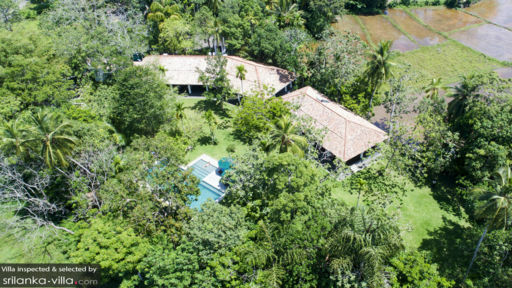 A gorgeous tetris-inspired swimming pool that sparkles under the tropical sun can be seen in the verdant gardens overlooking even more stunning views of flora. The pool is accompanied by a pool deck with rattan lounge chairs for sunbathing and tanning. There are parasols in case you wish to stay away from direct sunlight. The garden is equipped with a yoga shala for ideal sun salutations at the break of dawn. Relax in the veranda that provides sprawling views and has also been furnished with comfortable sitting. Boundary House lends many spaces that are dedicated to offer a comfortable, restful, and homely ambiance so you can feel at ease. The living area is one such room with its brightly-lit interiors thanks to the abundant sunlight, fresh ambiance, and excellent furnishing. The room is spacious and open-plan for spectacular views and ease of access. With air-conditioning, you can even keep the doors closed for a cooler environment. If you have some work, there is a desk space already setup for you. The villa even features a fully-equipped and functioning media room with cosy sitting that double as single beds for kids, a flat-screen TV, DVD player, and air-conditioning. For dining, head on outdoors to the terrace where you can dine on the alfresco dining table set up against a beautiful backdrop for wonderful views and even better ambiance. This romantic and intimate setting is perfect for many memorable dinners with loved ones. With many services to ensure you have everything you need when you need it, the villa is the perfect example of an efficient tropical holiday home. The staff includes a house manager so the villa runs smoothly each day and is well-maintained. The house chef is happy to prepare delicious local Sri Lankan food and even western dishes upon demand for guests. Found in an idyllic location surrounded by rice fields, the villa offers a zen ambiance, meditative views, and a lot of open spaces. It is neat the historical city of Galle where the Galle Fort is a UNESCO World Heritage Site. The gorgeous and striking Dutch-era architecture of the city along with local markets and fort walls make for a wonderful experience.